If you’re in the market for a supersized smartphone with a stylus, but have been put off Samsung after the whole Galaxy Note 7 debacle then LG’s new handset might be for you. Say hello to the LG Stylus 3. There’s no mistaking what the main selling point of this phone is, it’s right there in the name. The stylus itself slides nicely into the body of the Stylus 3 from the top right corner, and the phone can detect when the pen is in and out of its frame. Slide the stylus out and a circular pen icon will appear on screen – give it a tap and you’ll get a few shortcuts to drawing and note taking applications allowing you to wield the power of the pen almost instantly. The Stylus 3 is responsive and stylus input is smooth. Opt to write with a fountain pen style and the Stylus 3 can detect the angle your using the stylus for realistic handwriting on-screen. The Stylus 3 also features ‘palm rejection’, allowing you to rest your hand on the screen while you write without the phone freaking out from the additional presence of your palm. 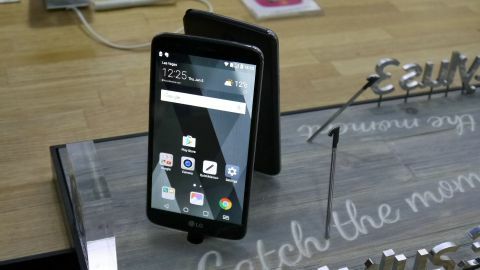 For the most part though, we found it generally quicker to enter text and navigate round the LG Stylus 3 with our fingers – but smartphone styluses have always been a niche product and there will be people this appeals to. Looking round the phone and the plastic build of the Stylus 3 shows you this isn’t a handset that will replace the fallen Galaxy Note 7 – rather it’s a cheaper alternative for those not willing (or unable) to spend a large amount of cash on a big screen phone. And a big screen you get, with the LG Stylus 3 packing a 5.7-inch full HD display which is bright and colorful. On the back a fingerprint scanner sits below the camera, and it also doubles as the power/lock key for the Stylus 3. We’re pleased to see the digit reader on another mid-range handset, although the rear placement does irk us slightly as you can’t use it when it’s lying on a desk. Never mind. The plastic body may not be premium, but it does feel solid and for a large phone we found the Stylus 3 was still pretty easy to hold. Under the hood the Stylus 3 boasts a 1.5GHz octa-core processor and 3GB of RAM which keeps Android 7 Nougat (with LG’s own interface on top) ticking over nicely. Navigation around the phone is slick and apps loaded promptly for us. Something which mark annoying Android fans when picking up the Stylus 3 for the first time is the lack of an app draw – but panic not. It can be easily re-instated from the settings menu. Phew. 16GB of storage in the Stylus 3 isn’t great considering how much space Android takes up these days, and the ever increasing sizes of apps means what storage you do have fills up quicker. It’s saving grace is a microSD slot hidden behind the removable rear panel which supports cards up to 2TB in size. Behind that back panel you’ll also find a removable 3,200mAh battery – something of a rarity in today’s mobile market – and we hope it will last at least a day on a single charge. Keep an eye out for our full review to see just how it performs. In terms of cameras you’re looking at a rear facing 13MP snapper and an 8MP selfie option on the front. Both are perfectly serviceable, but they’re not going to blow you away with their quality. The front camera does offer an on-screen flash though, allowing you to get beautifully illuminated selfies. There’s currently no information on the LG Stylus 3 release date and price, but we’ll update this hands on review as soon as we know.